Have you ever felt like you would never fit in? Of course you have, we all have at one point or another. But for some this is not simply being awkward socially, but much more. For 10 year old Matica, the problem is a physical one. She is not growing. Despite her age and having a younger brother, Matica has the body of a much younger child which has made her life a real challenge as far as making any friends in the little village in Peru where her parents are missionaries trying to help the local tribe. The tribe finds Matica’s situation strange and tend not to associate with her, making her more lonely than ever. However, Matica does have knack for making friends. In this case its a pair of condors, which seems to fascinate the local villagers. But they are even more surprised when the bond between the undersized girl and the huge birds becomes so strong that when their egg is threatened by poachers they allow her to watch over and care for it. Soon the egg hatches and Talon is born. The villagers are more impressed than ever by the young girl as she helps raise the young condor, becoming an expert on the birds and soon Matica finds herself no longer the source of curious glances but a bit of a celebrity. But her true love for family and her condors never takes a backseat to this new status. 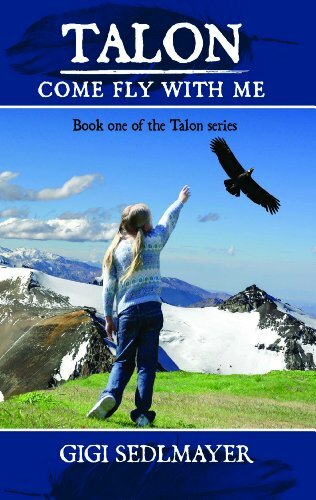 Her dedication to both her families is unwavering and continues to grow just as quickly as Talon who is soon big enough and strong enough to take flight. But is he powerful enough to grant Matica’s most secret wish? Aimed at preteens, this is a story that can be enjoyed by any age. As I said at the beginning of this review, we’ve all felt out of place and thought we’d never find where we truly belong. Matica’s journey is a tale that everyone can relate to. Sometimes its not finding where YOU fit in, but making a place for yourself in the world and watch it start swarming towards you. This is such a wonderful tale, I have not problem giving it the 5-Star rating it deserves. I’m even more delighted to know that this is only the first installment. As of the writing of this review, there are four more books in the series. Needless to say, I’ll be adding them to my library and more reviews will come with time. And now I will take my hat off to the author Gigi Sedlmayer, may she, Talon, Matica and the rest of this fine cast soar high and far for many years to come.